Well, call me a coward, but I have been avoiding writing this review like the plague. Actually, worse, considering I'd run towards a plague before I ran towards writing a review for this. I always have two feelings when I finish a Melina Marchetta novel. One, of being incredible happy, content, and simply awe-struck for the novel is always amazing beyong belief; and second, of feeling ever-so-slightly nervous because, let's be honest, how could I ever possibly even think or imagine how to write a review that would do the book I read justice of any kind? Well, I can't. What I can do, however, is tell you that I loved Quintana of Charyn. It is a beautiful, provocative, and gorgeously written novel that ties up all loose ends, concludes this series without flaws, and renders me speechless. Yet, for the first time, I have to admit that there is something about this book that fell just a tiiiny bit flat for me. I feel like a traitor saying this, especially considering I've given every single one of Marchetta's novels 5 Stars and even went out of my way to order this novel from Australia because I couldn't wait to read it and it was only releasing in America around six-ish months later, but, when compared to all of Marchetta's prior works, I feel as if this just might have been her weakest novel yet. 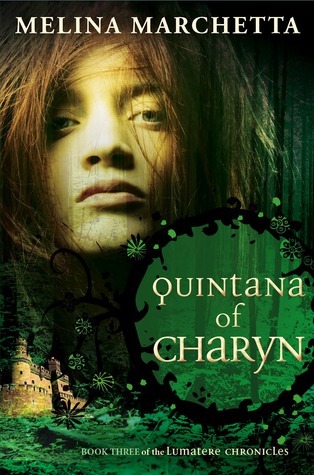 When I began Quintana of Charyn, I thought for sure that it would wind up being my favorite of the Lumatere Chronicles. Well, Finnikin of the Rock still is, although I suspect Froi of the Exiles would be if I re-read it, knowing all that I do now about Quintana's character. Nevertheless, somewhere a little after the half-way mark of this story, Quintana began to steadily lose me. It wasn't that the story lagged or that I was bored, it was simply that it was too overly dramatic. I didn't need that many scenes or that much build-up and prolongment to the happy ending we all knew was awaiting us. I found myself wondering why so many pages were still left when not so much of the actual story was left at all. It was a very well-written conclusion that brought a smile to my face, but the fact that it fell into the let-me-be-a-dramatic-conclusion trope was rather disappointing. Nevertheless, Quintana of Charyn is simply breathtaking. Marchetta has a gift for weaving together multiple story lines and the gradual manner in which the lives of Finnikin, Froi, Isaboe, Lucien, Phaedra, and Quintana herself all came to be together, intertwined and interlapped with one another, was truly beautiful. It is evident, with every novel that she writes, that Marchetta takes on astounding themes and valuable life lessons, but perhaps what I loved the most about Quintana especially was just how real everything felt. We often go through life and reach points where everything seems to fit together like a puzzle piece; we realize that things all happened for a reason and that reason was to bring us to this point. Well, reading this novel is a little like that too. It never feels forced or rushed, but all flows so naturally that it's easy to forget you're reading about people who aren't real, who aren't there in front of your eyes, whose suffering isn't your own because it certainly feels that way. Another one of the best things about this novel was its heavy emphasis on friendship and the growth that each of the characters experienced, despite the fact that we had met them before and seen them grow before; like humans, they still had a long way to go in their lives and were never finished fully growing after all. Isaboe and Finnikin, for example, are the characters we've known the longest, but the turns their relationship took, the hurdles they still had to cross, were so very realistically drawn-up and handled. Quintana, too, faced immense change as she formed bonds of friendship with Phaedra and the other Charynites in the Lumaterean valley. Theirs was a friendship reminiscent of that from Saving Francesca, my favorite Marchetta novel to date, and their gradual trust and understanding of one another moved me beyond words. Yet, it was the story of Phaedra of Alonso that tugged the most at my heartstrings. Phaedra is a character that is easy to overlook for she isn't in-your-face courageous like Isaboe and she isn't strange-but-beautiful like Quintana. Instead, her strength lies within, in her resolve and belief and faith in others. It is easy to paint her in the picture of a saint, but her inner struggles and the constant hurdles that she faced and even the times when even she seemed to lose hope only added to the realistic quality behind this story and the whirlwind of emotion that came with it. Moreover, Lucien and Phaedra's relationship is, without a doubt, my favorite of all the young couples in this series. Although Finnikin is my sweetheart, I couldn't keep the helplessly wide and cheesy grin from my face whenever Phaedra and Lucien interacted, or just whenever Lucien made an appearance. Note, however, that I said young couples. You see, my favorite couple in the entire novel is the one between Gargarin of Abroi and his wife, the beautiful Lirah. For some reason, seeing couples who have weathered storms and still managed to stay together, acting so sweetly even after having children and as they age, always yanks my heart in weird directions. Furthermore, this may have something to do with the fact that Gargarin, with his (admit it) social awkwardness at times, his scholarly role, his shyness at admitting his true feelings for anyone, his (rather) pessimistic thoughts, and yet his deep, deep depth of feeling for his family, is somehow one of my favorite characters of all time, perhaps because he tends to remind me of myself at times. It is Gargarin's story line, with the flurry of feeling that he holds for his twin brother, that broke my heart a million times over in this novel. Truly, these brothers never cease to amaze me. Froi too, whose life is intertwined so closely with Gargarin's, is a character that continues to astound me with every novel, especially due to his rocky relationship with his parents and his constant inner struggle between his Charynite and Lumaterean selves. I love how Marchetta explores dedication to ones nation, ones Gods, and ones faith. It's all so beautifully intertwined that I can't even describe it properly only to say that it brought me to tears on so many occasions. It is evident that Marchetta knows what it feels like to be an immigrant, an exile in ones own nation, and she captures this paradoxical ideal perfectly. While I did feel as if the amount of Froi and Quintana time was significantly lower than that of any other couple in this novel, I enjoyed seeing Froi's affection grow with distance and see his bonds with his family finally come to a full, blooming, and caring circle. Melina Marchetta is an author I can count on to bring me to tears, to make me just lay there on my bed, thinking for hours on end every time I finish her books, and Quintana of Charyn definitely did not disappoint. It may not be my favorite novel of hers, but it is a memorable one nevertheless. It's one that won't stray too far from my thoughts for the messages this series extols about love, patience, hope, faith, belief, and friendship. Now, looking back on this series as a whole, I can truly admit that everything has come around in a full circle and Marchetta continues to render me speechless with the beauty of her work. If it isn't evident already, here is a woman who can write, who can capture emotion, who can convey belief, and who has managed to take on one of the toughest, most complex and intriguing series I've come across and truly make it work. If this isn't a testament of Marchetta's skill, then I don't know what is. All I can do now is wait for the Jellicoe Road film that is currently under production and keep my fingers crossed for another Marchetta novel soon, because I simply cannot get enough of this writing...this beauty. I'm glad you mentioned Saving Francesca, as the relationships in that book were probably my favourite of all of Marchetta's. I don't know why I haven't read this yet in all honesty, especially after how badly I wanted it when finishing Froi. I don't understand myself sometimes. :P Anyway, 4.75 stars is very high indeed! Brilliant review, Keertana. I agree with Sam! 4.75 stars is very high indeed! ;) AAAAA I really want to start the Lumatere chronicles so badly. I have the first book but I haven't read it yet. I loved Melina's contemporary books so hopefully I'll love her fantasy series too! Awesome review, Keertana ♥ So glad you enjoyed Quintana! Oh I love this review! "...Another one of the best things about this novel was its heavy emphasis on friendship and the growth that each of the characters experienced, despite the fact that we had met them before and seen them grow before; like humans, they still had a long way to go in their lives and were never finished fully growing after all..."
I wish for Marchetta to announce that she's going to be continuing with the series EVERY SINGLE DAY. Amazing review, Keertana! I was just a tiny bit disappointed with this one too. It was a worthy conclusion to what is quite possibly my favorite trilogy of all time, but in more ways than one, I expected more. For me, Froi of the Exiles is a book in a league of its own, impossible to compare to anything else out there. I understand that it set a pretty high standard, but I guess the lovely MM spoiled us a bit. Anyway, yes, I loved it, but my favorites were Trevanion and Beatris. Those two are just amazing. I adore this series SO much! I almost ordered this but I'm so overwhelmed with books that it just doesn't make sense to order one from Australia. Who knows though, I might still do it. I'm so happy to hear that it ends nicely with no loose ends. I NEED a HEA for these poor characters. I'm with you, after reading Melina Marchetta I can lay on my bed for hours thinking about the book. Love her! I love how you talked about how real this book feels and also how important friendships are to this story. Yes. and Yes. A truly heart felt and honest review. LOVE.